Mr. Chancellor, the service record of Lieutenant General, the Honourable Roméo Dallaire (Retired) is highlighted by extraordinary humanitarianism, courageous actions and compelling words. Through the course of his distinguished 35-year military career, he served in staff, training, and command positions throughout North America, Europe, and Africa, rising in rank from Army Cadet to Lieutenant-General. Most notably, General Dallaire was appointed Force Commander of the United Nations Assistance Mission in Rwanda prior to and during the 1994 genocide. Along with a small contingent of Ghanaian soldiers and military observers, he famously disobeyed the Security Council’s command to withdraw and remained in Rwanda to fulfill an ethical obligation to protect those who sought refuge with the UN forces. His courage and leadership during this mission earned him the Meritorious Service Cross, the United States Legion of Merit, the Aegis Award on Genocide Prevention, and the admiration of people around the globe. His defiant dedication to humanity during that mission is well-documented in his best-selling books, including Shake Hands with the Devil, which won the Governor General’s Literary Award for Non-Fiction and the Shaughnessy Cohen Prize for political writing, awarded by the Writers’ Trust of Canada. Since being medically released from the Canadian Armed Forces in 2000, Lieutenant General Dallaire has served on the UN Advisory Committee on Genocide Prevention; as special advisor to the Minister of Veterans Affairs Canada; as advisor to the Minister of National Defense, and as special advisor to the Minister responsible for the Canadian International Development Agency on matters relating to war affected children. He was appointed to the Canadian Senate in 2005, a position from which he retired in 2014 in order to commit the fullness of his energy and passion to fulfilling an international destiny, the eradication of the use and recruitment of child soldiers. He is an Officer of the Order of Canada, a Grand Officer of the National Order of Quebec, a Commander of the Order of Military Merit and a recipient of the Harvard University Humanist Award. 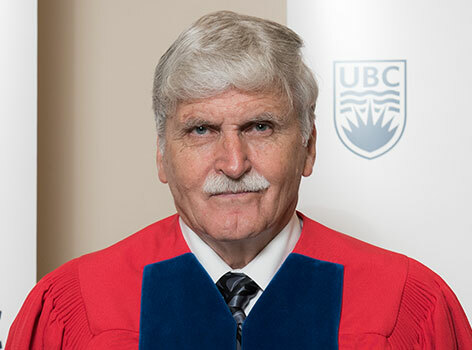 Mr. Chancellor, on behalf of a University dedicated to the advancement of a civil and sustainable society, and with both pride and lingering sorrow for those he sought to protect, I ask you to confer the degree Doctor of Laws, honoris causa, upon Roméo Antonius Dallaire.